What I’m currently using: the Paperblanks Blue Filigree journal, the Seven Seas Writer, and the Franklin Christoph Notebook. So…I’m not using the ONLINE fountain pen in the white checkerboard pattern like I’m supposed to. 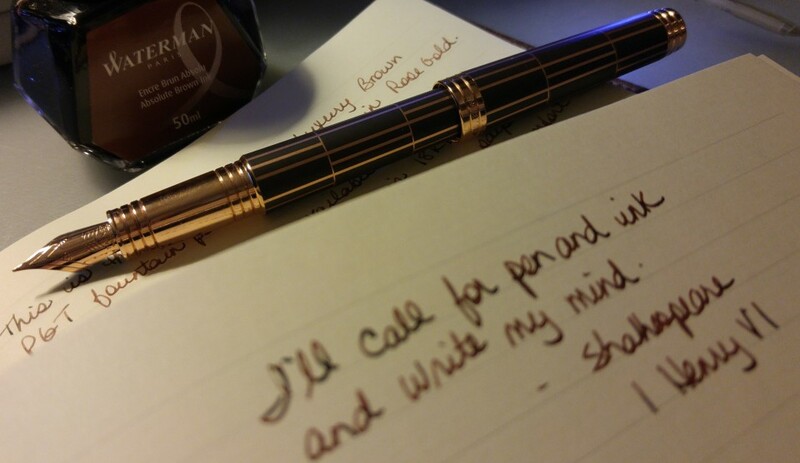 I just don’t like writing with it. Maybe it’s too light, or just a touch too slim. I tried but it’s just not working for me. It will probably end up in a giveaway 🙂 I will announce the pen for April on March 30. Don’t miss out on my next giveaway: the Pharaoh Notes Giveaway. It’s a notebook this time. The giveaway runs to March 26 so click on the link and leave a comment to enter! I’ve despaired of finding anyone to fix my Noodler’s Ink King Philip Purple Demonstrator (the section is not positioned correctly underneath the nib) so it occurred to me that I could switch out the barrel with the Maximilian Emerald Demonstrator. I love the colour of the King Philip and really wanted to try the De Atramentis Heather Violet ink in it. So I did the switch and now I have a beautiful purple and green pen – my first “frankenpen”! I’ll share a picture and give a review soon. I heard a lovely story on CBC radio about two lottery winners from the island where I grew up, Cape Breton, in Nova Scotia. That island has been gripped by “Chase the Ace” madness of late and recently a jackpot of $230 thousand or so was awarded. On the night of the big cheque presentation, two winners showed up. After verification and embarrassment and confirming phone calls, the lottery commission asked the two women to split the prize. They agreed but the charity organization, who was scheduled to receive the equivalent amount, decided to forego their share so both women could have their $230 thousand. The two women winners forged a bond during the tense 40 minutes or so that their fate was decided. And I thought to myself – in the big city would that shake out the same way? I wonder. Read about it here.